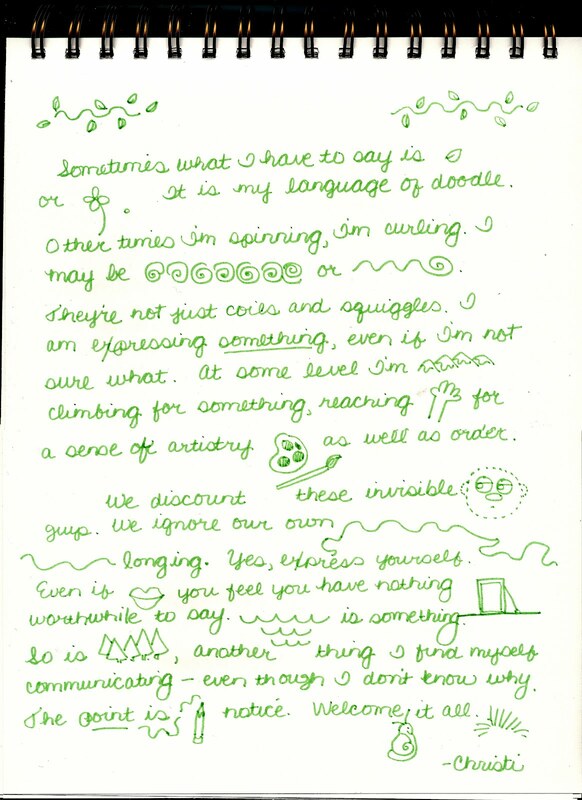 Sometimes what I have to say is (doodle) or (doodle). It is my language. They're not just coils and squiggles. I'm expressing something, even if I'm not sure what. At some level I'm climbing for something, reaching for a sense of artistry and order. We discount these invisible guys. (Doodle.) We ignore our own longing. Yes, express yourself. Even if you feel you have nothing worthwhile to say. (Doodle) is something. 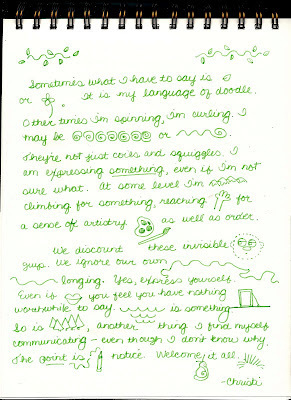 So is (doodle), another thing I find myself communicating - even though I don't know why. The point is . . . notice. Welcome it all. I love it. I don't doodle enough for the little girl in me. Recently I sat down and let her play for a while. We ended up with a picture of a mysterious hound woman in a cape. We named it " The Cloak of Doom". What followed was a the beginning of a story about a pixie. Who knew doodles could turn into such great prompts? Oh, that's right, you did.